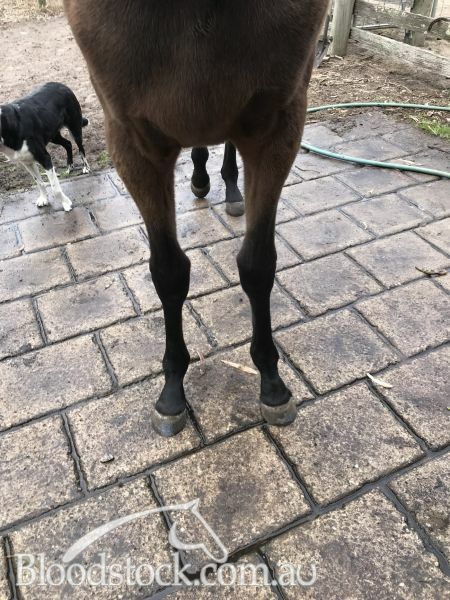 This yearling foal is well grown and was going to be kept to race. 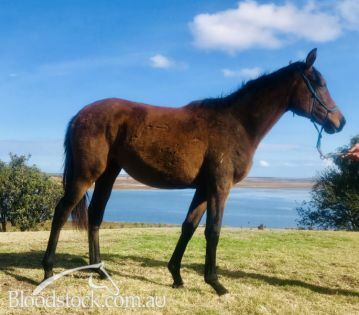 We just have to many running around and given the performance of her full sister, Lisa's Rainbow, we expect that she will be attractive to an astute buyer looking for a filly that will deliver on the race track and be a breeding proposition. TOORAK TOFF (AUS) (Chestnut 2007-Stud 2012). 6 wins-3 at 2-to 1400m, MRC Sir Rupert Clarke S., Gr.1. Sire of 165 rnrs, 91 wnrs, inc. SW Iconoclasm (MRC Weekend Hussler H., L), SP Toffee Nose and of Social Spin, Duality, Embezzlement, Toorak Comedy, Trakiato, Greywolf, Knock Toff, Speedy King, Strathclyde, Toorak Affair, Toorak Cowboy, Toorak Tower, Arriba, Gypsy Toff, Ship Creek, Toorak Smock, Dellacqua, Fanciful Toff, Miss Toorak Flyer, etc. Lisa's Rainbow (f by Toorak Toff) Winner at 1200m in 2018-19 in Aust. Le Societe (f Anabaa) 3 wins-2 at 2-at 1000m, 1200m, A$144,913, MRC Jim Conway 2YO H., MVRC Printhouse H., MRC Jack Daniel's Racing 2YO P., 2d MRC WW Cockram S., Gr.3, 3d SAJC Lightning S., L, 4th MRC Sir John Monash S., L. Producer. PARK LANE (f Elliodor) 6 wins to 1400m, R297,875, Kenilworth Fillies Championship S., Gr.2, Greyville El Picha Advance P., 2d Greyville Poinsettia S., Gr.3-twice, 3d Scottsville South African Fillies Sprint S., Gr.1, Greyville Umngeni H., L, 4th Kenilworth Southern Cross S., Gr.3. Producer. Mission Statement (g Jallad) 8 wins-2 at 2-from 1200m to 1600m, R291,975 in South Africa and Mauritius, 2d Turffontein Concor Spring H., Gr.2, Prime Time Video H., 4th Scottsville Byerley Turk P., Gr.3. Hancock News (f London News) 3 wins-1 at 2-at 1000m, R177,220, 2d Scottsville Kwazulu-Natal S., L, 4th Kenilworth Fillies Nursery, Gr.3. Producer. PLAYFUL FINGERS (f Defensive Play) 5 wins-3 at 2-at 1000m, 1200m, NZ$76,562, ARC Champagne S., L, Wanganui JC Waikato Stud S., L, Avondale JC Auckland Owners Cup, 2d ARC TV Guide Juvenile H., Avondale JC Sunday Markets H., 3d Hawkes Bay Gold Trail S., Gr.3, Masterton RC Lowland S., Gr.3. Producer. DUAL HEMISPHERE (g Danehill Dancer) Winner at 1800m, A$96,052, SAJC Hill Smith S., L, 3d MVRC Veolia Environmental Services H., VRC Peter Dwyer & Patricia Blencowe H.
MANUEL (g Commands) 8 wins from 1100m to 1600m, A$811,950, to 2018-19, MRC CF Orr S., Gr.1, Kilmore Cup, L, SAJC M&J Chickens Autumn Series H., MRC Pegasus Leisure Group H., SAJC Hughes Limousines H., Junction H., 2d ATC Star Kingdom H., Gr.3, SAJC Schweppes 2YO H., VRC Grinders Coffee Roasters H., Melbourne's Own 3AW H., SAJC Murray & Barb Stewart H., Barry Simpson H., 3d ATC Inglis Sprint, 4th VRC Maribyrnong Trial S., L.
TAKING AIM (g Choisir) 3 wins-1 at 2-at 1200m, 1400m, A$244,800, HK$2,553,900, to 2018-19, GCTC Ken Russell Memorial Classic, Gr.3, HKJC Panasonic 100th Anniversary H., Lukfook Beloved Collection H., 2d BRC Sires' Produce S., Gr.2, VRC Talindert S., L, 3d BRC JJ Atkins S., Gr.1. OUR QUARTET (g Palace Music) Winner at 2, WRC Wellesley S., L, 3d CJC Juvenile S.